Published with permission of copyright holder. Further reproduction prohibited. Augusta Daily Gazette [Kansas], “2004-04-03,” Digital Augusta, accessed April 25, 2019, https://augusta.digitalsckls.info/item/1406. Blanche Beatrice Rhodes, 85, Augusta, retired Oklahoma State Tax Commission employee and retired owner of Rhodes Furniture and Appliance, died Saturday, April 3, 2004. Graveside service at 2 p.m. on Wednesday, April 7, at Elmwood Cemetery in Augusta. For those attending, use the 12th Street entrance to the cemetery. 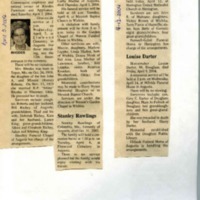 Mrs. Rhodes was bom in Topaz, Mo. on Oct. 24, 1918, the daughter of the late John A. and Minnie (Reese) Roberts. On Nov. 13, 1935 she married E.R “Shine” Rhodes in Shawnee, Okla. He preceded her in death. Survivors include: daughter, Roberta and her husband, Bill Richey of Augusta; grandchildren, Thad and his wife, Deborah Richey, Kara and her husband, Lance King; great-grandchildren, Allora and Elizabeth Richey, Adam and Whitney King. Headley Funeral Chapel of Augusta has charge of the arrangements. Marvin E. Leppke, 73, Wichita, retired Cessna Aircraft employee, father of Cathy Marbut of Augusta, died Thursday, April 1, 2004. His funeral service will be held at 10 a.m. Tuesday, April 6, at Messiah Baptist Church in Wichita. Leppke, sister, Beatrice Kroeker, both of Weatherford, Okla.; five grandchildren. Memorial contributions may be made to Harry Hynes Memorial Hospice or to Messiah Baptist Church. Services are under the direction of Watson’s Garden Chapel in Wichita. Stanley Rawlings of Columbia, Mo., formerly of Augusta, died Oct. 31, 2003. Elmwood Cemetery in Augusta. There is no service planned but the family would enjoy visiting with his friends. Helen M. Thompson, 78, Augusta, died Thursday, April 8, 2004. Her funeral service was held today, April 12, at Herington United Methodist Church in Herington. Survivors are: son, John E. of Mulvane; daughters, Vickey Brown of Wichita, Terry Pierce of Haysville; sister, Jean Betts of Garnett; eight grandchildren; four great-grandchildren. Penwell-Gabel Funeral Home in Herington has charge of the arrangements. Homemaker Louise Darter, 88, Douglass, died Friday, April 9, 2004. A memorial service will be held at 1 p.m. on Wednesday, April 14, at Hillside Funeral Home in Augusta. Survivors include: son, Gary E. Darter of Douglass; daughter, Mary Jo Pollock of Douglass; two granddaughters; and two great-grandchildren. She was preceded in death by her husband, Harry Darter. Memorial established with the Douglass Public Library. Hillside Funeral Home of Augusta is handling the arrangements.